As previous posts have noted, family historians of Berrien County, GA have struggled with the confusion of the two Confederate officers named Levi J. Knight. Apparently, even during the war, the Confederate States Army suffered the same confusion. In July 1861, Captain Levi J. Knight, early pioneer of Ray City and Berrien County, called for 100 volunteers to go with him to the fight for the Confederacy. These men were mustered into Confederate service during the summer of 1861 at Big Shanty, Georgia and joined the Georgia Volunteer Infantry as the Berrien Minute Men. This company traveled to Savannah where they trained and served near the Georgia coast. Some time after Levi J. Knight was promoted to Major of the 29th Regiment his nephew, known as Levi J. Knight, Jr, became Captain of the Berrien Minute Men. Later, while stationed with “companies at Advanced Batteries, Savannah River, GA, commanded by Lieut. 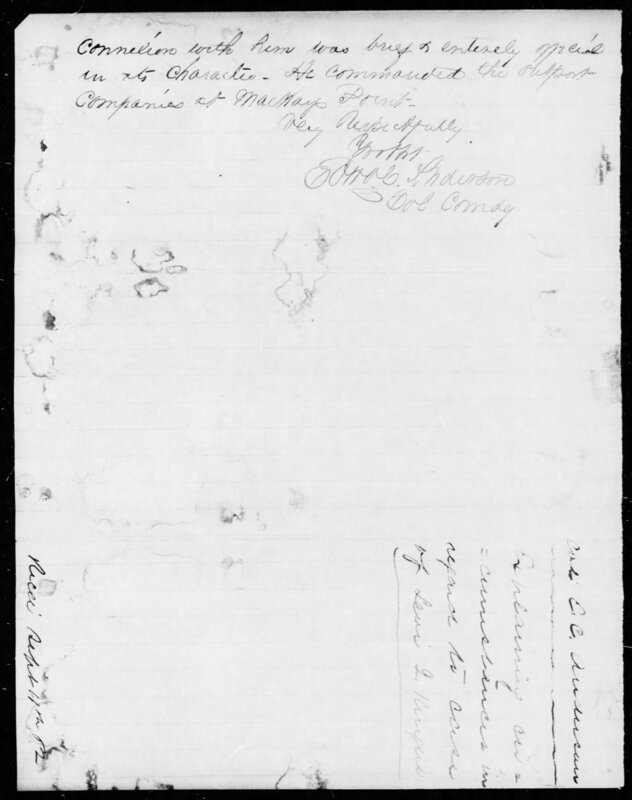 Col. Edward C. Anderson, C. S. Artillery,” Levi J. Knight, Jr was charged with incompetence. Major Knight, at 58 years of age and suffering from asthma, did not serve through the war. On May 14th, 1862 he retired from service and returned to his home. 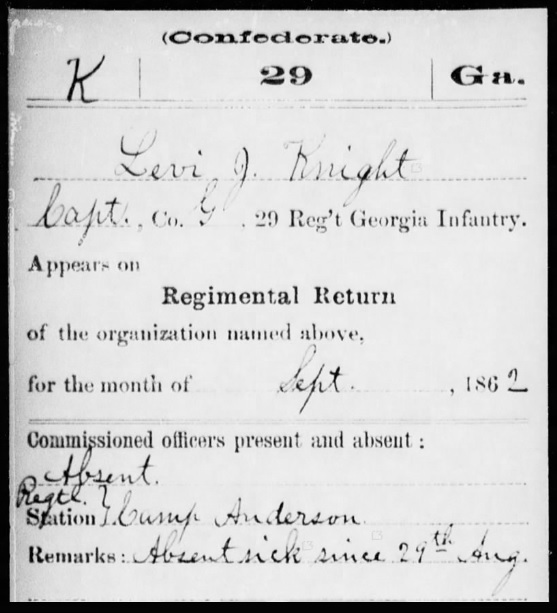 Three months after L. J. Knight’s separation from the Confederate States Army, questions arose about pay he had received while serving as Captain of Company A, 29th Georgia Regiment. The Quartermaster General, A.C. Myers, reported the matter on August 12, 1862.
to report to you that Capt. paid Oct. 31. & again Nov.
1862 letter from the Adjutant General’s Office alleging that Levi J. Knight defrauded the government of the Confederate States of America by drawing pay twice for the same month. At the Savannah Headquarters of Brigadier General Mercer, responsibility for the investigation was overseen by Captain George A. Mercer, Assistant Adjutant General. 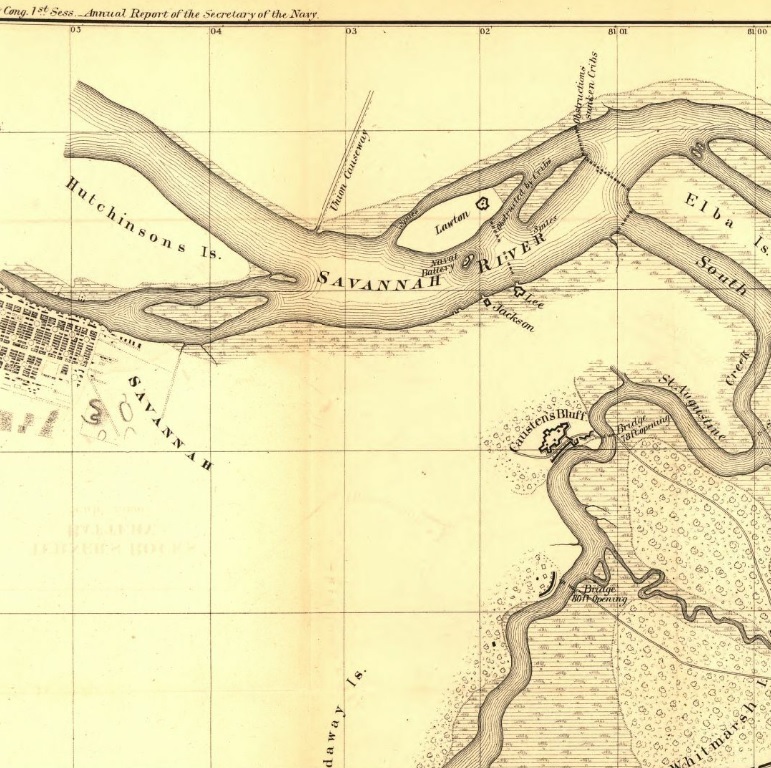 Captain Mercer further delegated responsibility for the investigation to Colonel Edward C. Anderson, commander of the Savannah River Batteries. Apparently, Colonel Anderson was familiar with the case and was able to make a quick response to Captain Mercer. specified viz October 1861, was not a Captain. bears the character of an honest old man. 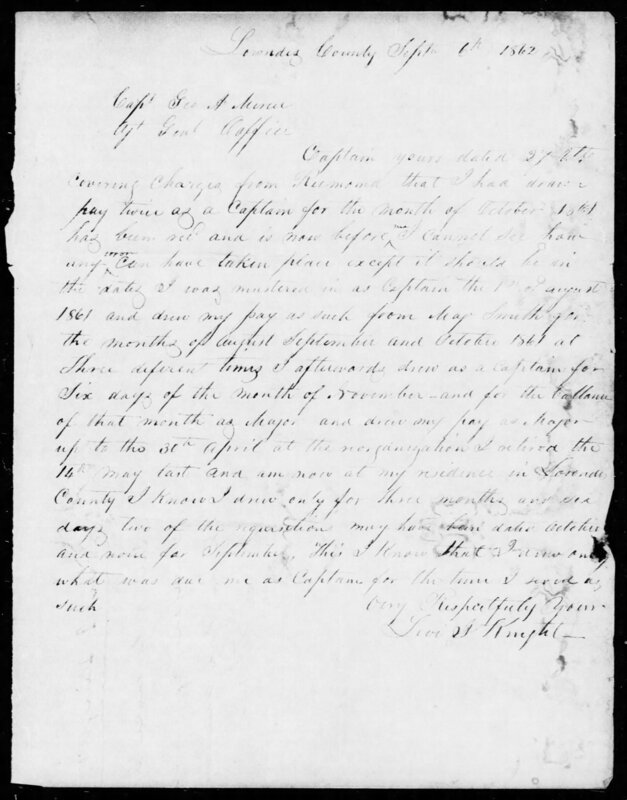 Colonel Edward C. Anderson letter of August 27, 1862 explaining confusion over the two officers of the Berrien Minute Men named Levi J. Knight. to request that you will return them to this office. sire to make to the Authorities at Richmond. 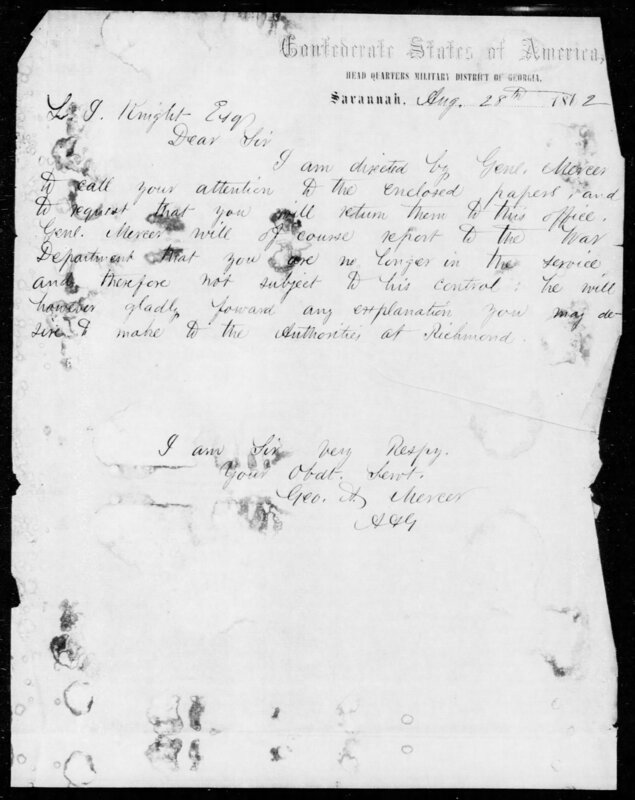 Captain George A. Mercer letter of August 28, 1862 to Levi J. Knight offering him the opportunity to respond to allegations that he drew double pay while serving as Captain of the Berrien Minute Men. 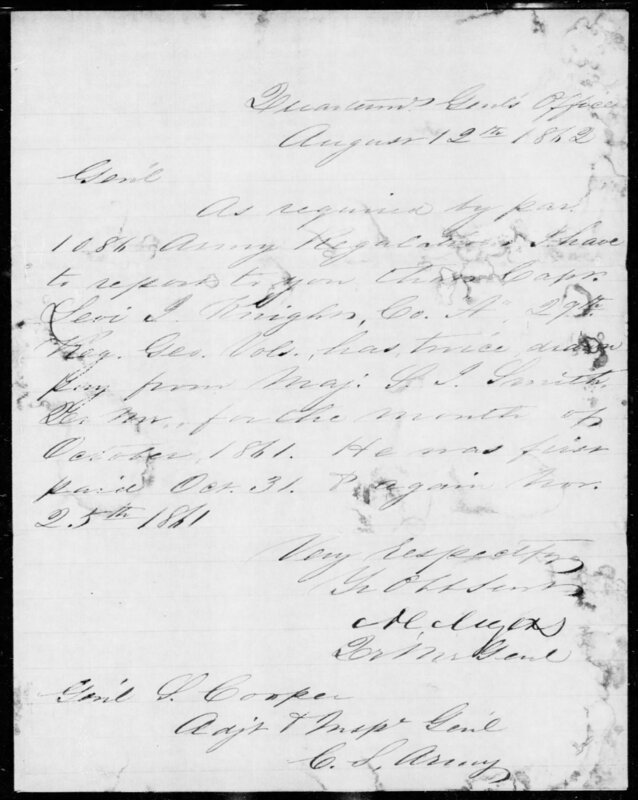 On September 6, 1862 Levi J. Knight wrote a response to Captain Mercer indicating that he never drew double pay and that the error must be in the bookkeeping of the Quartermaster Generals Office. 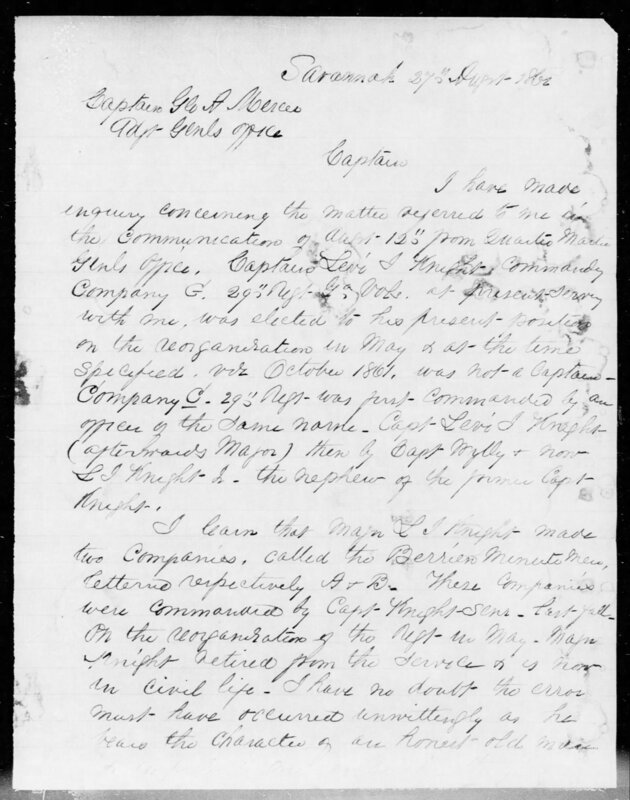 Levi J. Knight letter of September 9, 1862 to Captain George A. Mercer.